These are a few of our favorites for the month of November. When this shirt arrived the first thing I noticed was how soft the fabric was. Once I wore out to a Halloween event and felt how good it was on my body I thought how outstanding it really is. 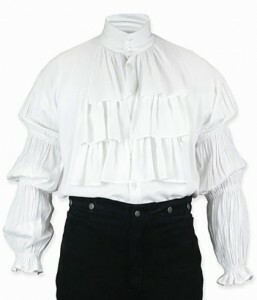 I wore it with my velvet collar mourning coat black white spat boots and my nobleman’s cane and stood out. I can recommend how comfortable this shirt is. 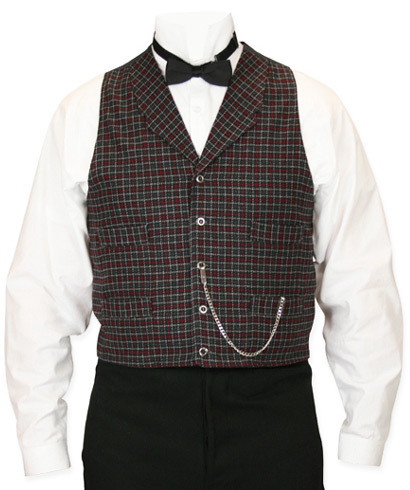 You must not wear a vest/waist coat with it though as it will hide the overall beauty and fine craftsmanship/tailoring of the shirt unless you wear an open vest. Once more a wonderful item from this company with fast shipping. This jacket was a hit! Everyone at the Victorian wedding I attended loved it and laughably, wanted to touch it! Looked very sharp with a vest and puff tie! Will be able to use this out again with a nice pair of jeans! Very pleased! Do you own any sage colored clothing in your wardrobe? I do now thanks to The Emporium! And did you also know that another meaning for sage is to be very wise? 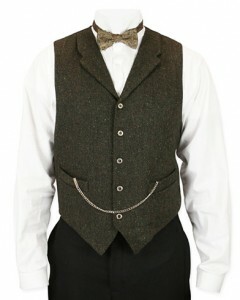 Which is exactly what you would be for purchasing this vest. It’s soft, subtle, brownish-green colors blend into this handsome, lightweight herringbone patterned fabric giving a very distinguished and polished appearance to its bearer. Be wise like me and get this vest! 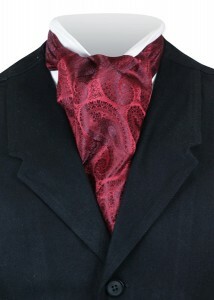 Tonal Paisley Ascot – Burgundy: Quality and Beauty! This ascot was picture perfect in so many ways! 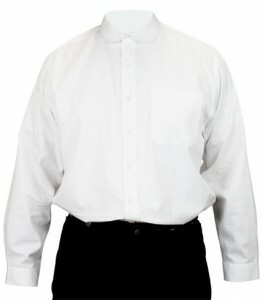 It was neck wear of exceptional quality and steadfast rigidness. 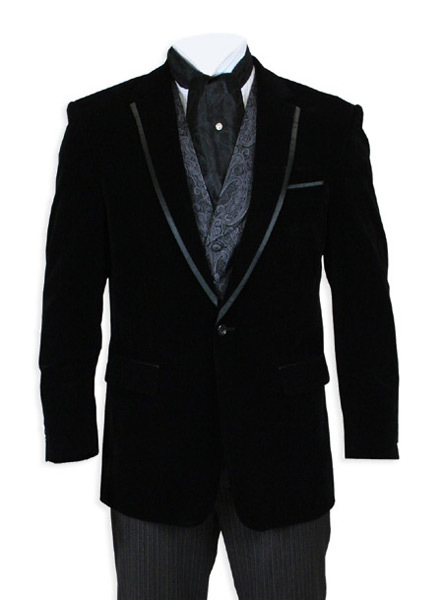 It, and you by proxy, will look sharp. Everything about buying this item was awesome, from the great person I spoke with on the phone, to the speedy delivery that exceeded expectations. 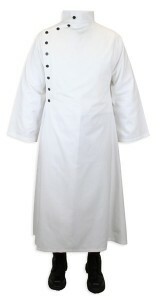 The lab coat itself is beyond great! I bought it for a costume contest at work, and would have won, but my rival had better legs. Seriously, if I was an actual mad scientist, I couldn’t ask for a better lab coat, the quality is that good. It’s not just some flimsy item that would look good on stage, the material, construction, and workmanship are all excellent. 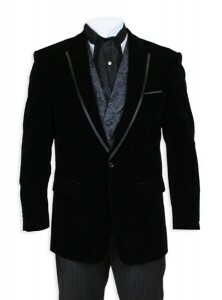 I ordered this for the father of the bride and it was perfect under his gray suit. He was the talk of the evening and received many compliments on this distinctive vest that gave him a very distinguished look and set him apart from those in the standard matching three piece suits. Very well made and definitely a piece that he will wear again and again. Sizing of XL, which he wears in everything, did seem more roomy than other pieces he has, but the back buckle fixed that. I am always wary of ordering clothes by mail or from the internet, but I needed a Victorian/Edwardian club-collared short, so I took a chance when I stumbled across The Gentleman’s Emporium. To say the least, I’m glad I did. The shirt (of very high quality) fits perfectly (which isn’t all that common as I lift weights four day/week).